EVERYTHING IS THERE! THE SUN-THE SEA-THE CALM-THE HEATED SWIMMING POOL ... what are you waiting for! contact us for any information, we will be happy to inform you. In the heart of ST MARTIN, a UNESCO heritage village, village protected by the ramparts of VAUBAN storms and others, 2 steps from the Port and its restaurants, this small house retaise is a small nugget: with a private pool and heated (rare on ST MARTIN) with 2 sunny courtyards, a bright living room, open kitchen, 2 bedrooms, shower room with sink and toilet, 1 separate toilet. All in peace. in the heart of ST MARTIN. Free WIFI. Note: Open swimming pool, heated on mid-April / end of September: the period can be checked according to the weather. Parking spaces in front of the house are non-paying, collective and subject to availability. 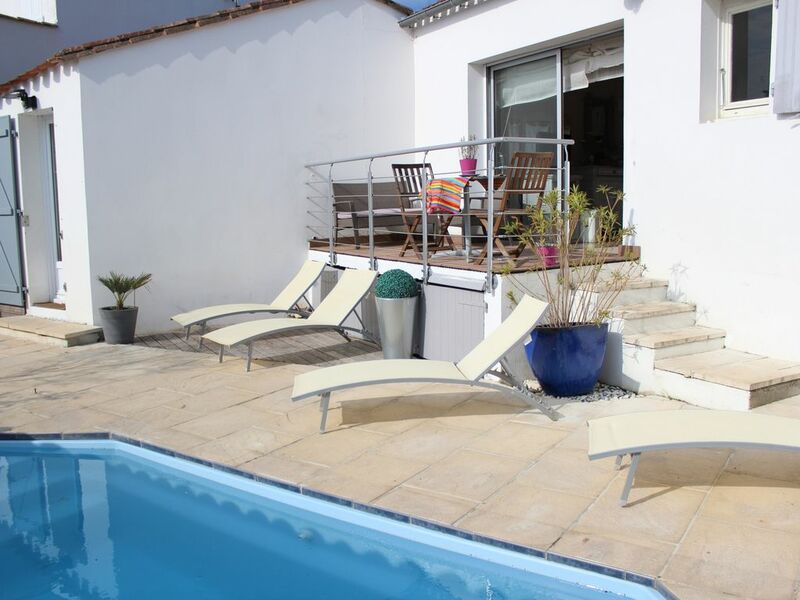 I’m delighted to know you had a great family holiday in our typical fisherman house from St Martin de Ré. The surface of the house agree with way of life of Ré Island. We optimized the house with a modern comfort, essential for the well-being of our guests. The heated pool (5mx3mx1.40) is very appreciated by children and families because they can play safety everywhere. I will be happy to receive you when you will come back next year. "An excellent location in a quiet residential area. A charming and comfortable house with a pool and car parking (particularly useful as public car parks now charge)." "A very convenient location, 5/10 minutes walk from St. Martin harbour. It was our second visit to Ile de Re and we shall most definately return. The swimming pool was perfect for our toddlers and bedrooms remained lovely and cool, even when the weather was hot. The outdoor space was very generous, with a lovely yard at the front which caught the evening sun - perfect for our BBQs. We hired bikes, so the supermarkets and other villages were all within cycling distance. The house was very clean and in a quiet and peaceful location. A very enjoyable holiday for all the family." "Lovely house in central and quiet location near to shops, restaurants and beach. Swimming pool is great when the weather gets very hot." A quelques roues de vélo du port et des plages, cette maison joliment décorée est un vrai bonheur !! Les enfants ont bien apprécié la piscine chauffée et nous la terrasse ensoleillée. La maison est bien organisée, il ne manque rien et est très confortable et très propre. Hâte de revenoir l'année prochaine !! Merci pour cette appréciation. L’accueil et le bien être de nos hôtes restent notre priorité. Nous avons passé un sejour merveilleux dams ce havre de paix . parfait pour les petits et les grands. Maison adorable et exterieur avec petite piscine très agreable. Vivement recommandé. La Rochelle, cross the bridge of the island of Ré, and take direction ST MARTIN DE RE. Skip the walls of Vauban.